This La Femme 27452 dress is the definition of perfect! It starts off with a modest halter neckline, however the back is open! In the back, it criss-crosses and is clasped together in the middle. 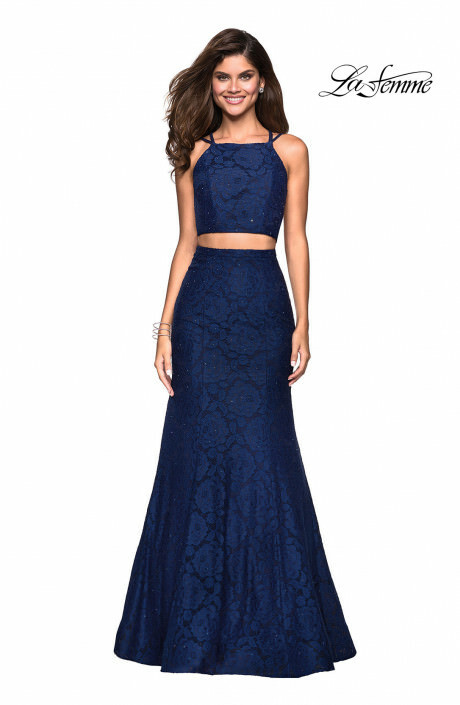 This dress is made with a stretch lace material, so you will be able to move freely out on the dance floor! The bottom of this dress is mermaid, so it is fitted at the top and flows out at the bottom. To make this dress even more better, it has iridescent stones throughout the whole dress! What more could a girl wish for then a little sparkle?